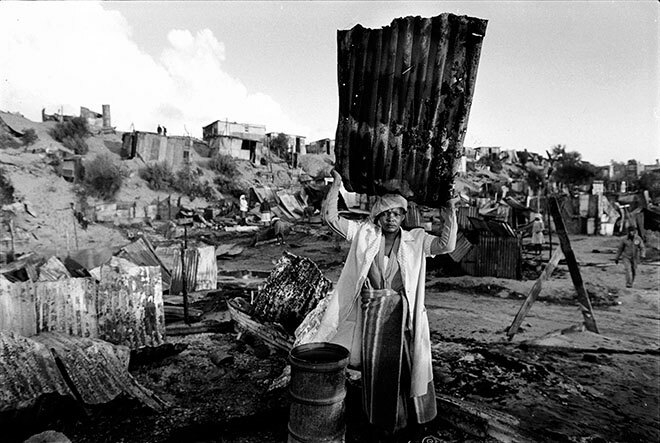 A woman salvages building material after her shack was burnt down in a conflict between right-wing ‘witdoeke’ vigilantes and the ANC ‘comrade’ groupings. In this week of violence, thousands of shacks were burnt down as vigilantes attacked militant-controlled areas, and many were killed or injured. The security forces were siding with the witdoeke during this conflict. 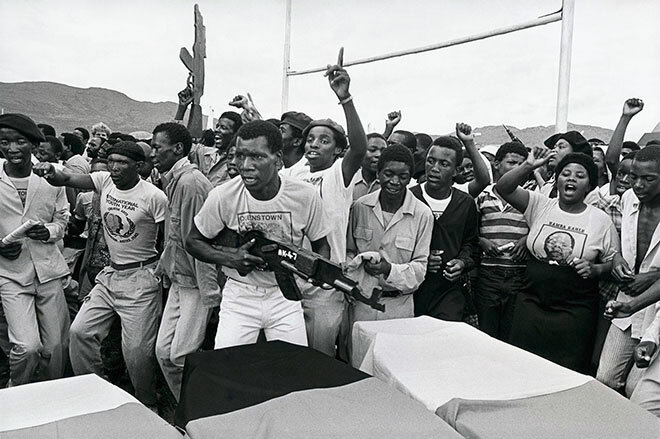 I began my career documenting the intense conflict and political upheavals of the 1980s in South Africa. 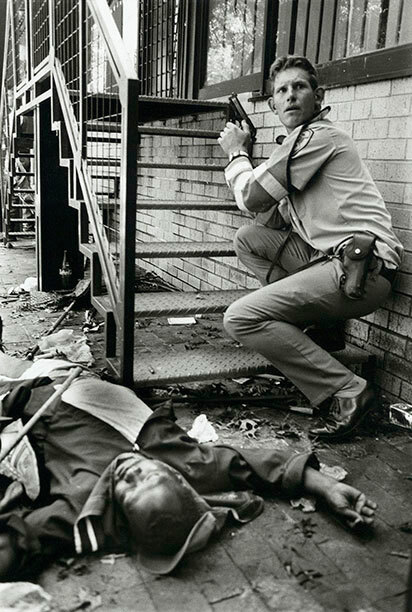 This was a crucial period in the struggle against apartheid and I was part of a young generation of ‘struggle photographers’ committed to documenting the political mobilization of the time. Though I was employed as a news photographer, these circumstances did not allow for objectivity. I witnessed violent repression by the State and multiple funerals of young township activists. 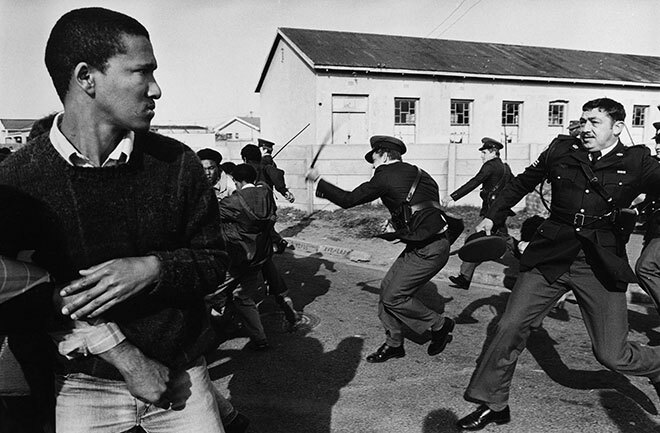 These images are partisan, and framed against the background of the immense suffering of black people under apartheid. Looking back now, I see that I was trying to make sense of this turbulent period with no idea that change was so imminent. 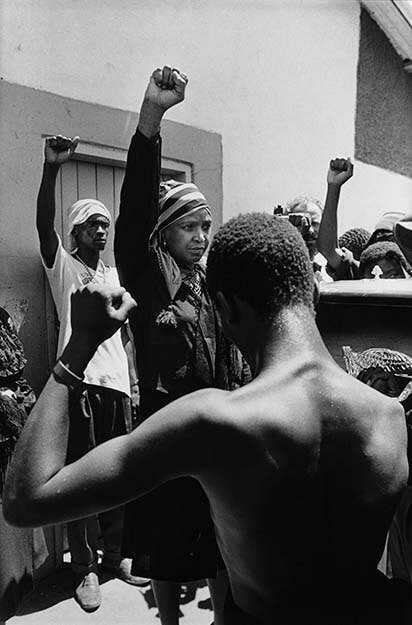 This work was made at a time when the moral and ethical fault lines in South Africa were very clear, and the experience has strongly influenced my approach to photography since. 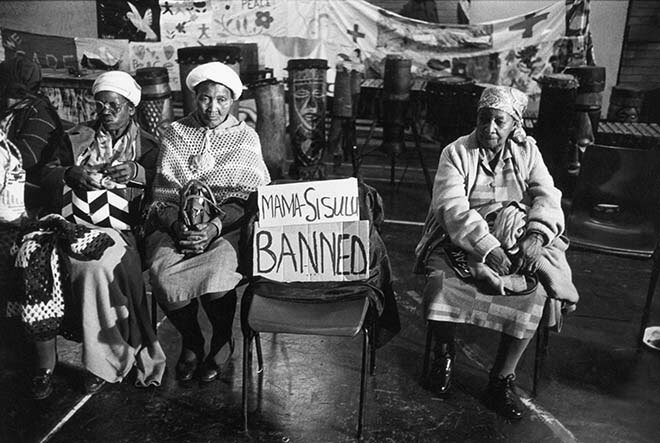 An empty chair for Albertina Sisulu at a political rally, under her sixth banning order at the time. Sisulu was one of South Africa’s most respected anti-apartheid activists and wife of ANC leader Walter Sisulu. 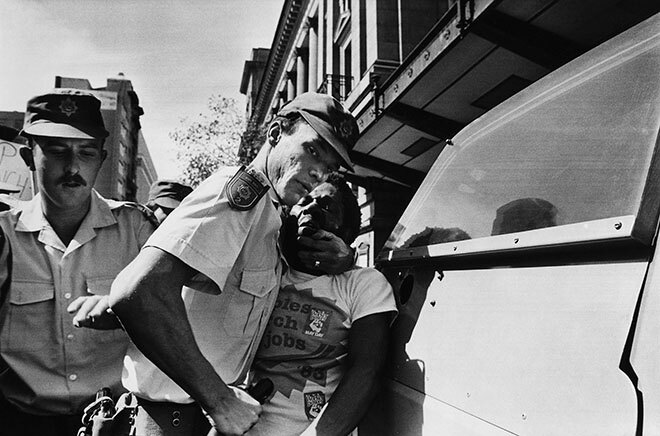 As thousands of marchers attempted to set off from different points in Cape Town to Pollsmoor prison to demand the release of Nelson Mandela, the marches were violently disrupted by police. 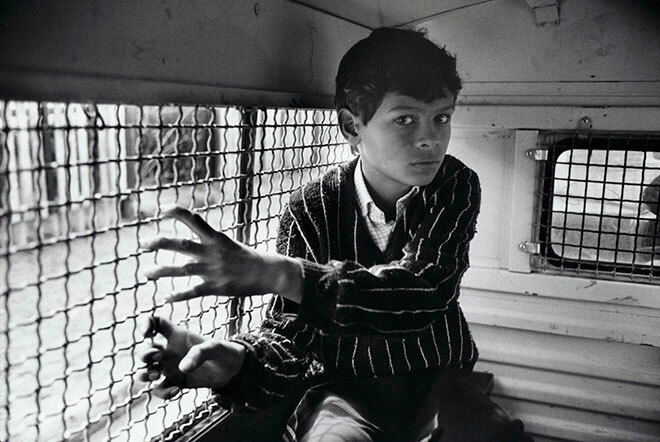 During the protests, many children were arrested and tortured. I was arrested alongside this child, who had been throwing stones at the police. Children burn the car of a suspected police informer after a mass funeral in Duduza. The suspected informer was later rescued by Bishop Desmond Tutu. 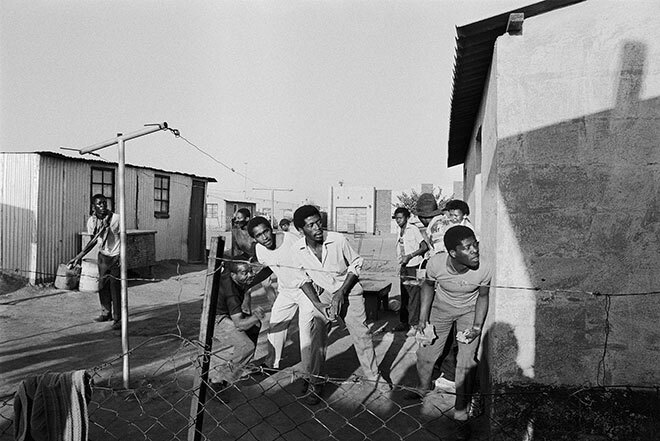 Police attack demonstrators with sjamboks (rubber whips) during the outbreak of street protests that accompanied the Pollsmoor march. Nine people were killed that day and by the end of the week the death toll had risen to 28. 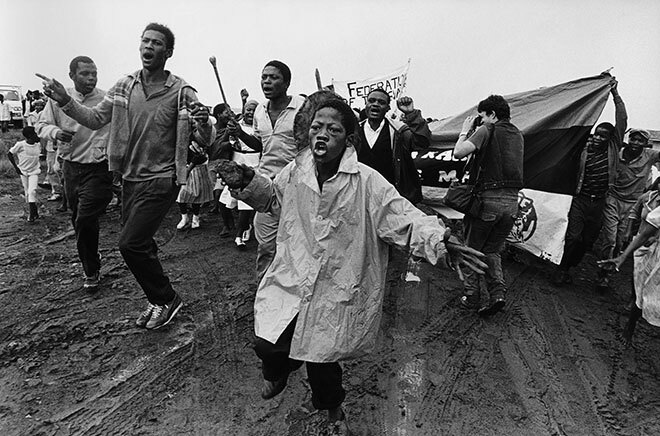 This event helped spark an outbreak of street protests and severe unrest across Cape Town. Young men, rocks at the ready, wait to attack a security force vehicle after confrontations broke out following a mass political funeral in Duduza township in the East Rand. The cycle of funerals, followed by violence, leading to further funerals became an all too common feature of this period. After the funeral of a three-year-old child shot in the head by a policeman’s rubber bullet, angry mourners clash with the police near the family’s home. In this confrontation a woman flings a stone at a policeman who is leveling his shotgun, while a child carrying a plate from the funeral feast runs away. A ‘comrade’ armed with a panga flees teargas fired by police during a confrontation between traditionalist vigilantes and the radical comrade groupings in KTC Squatter Camp. 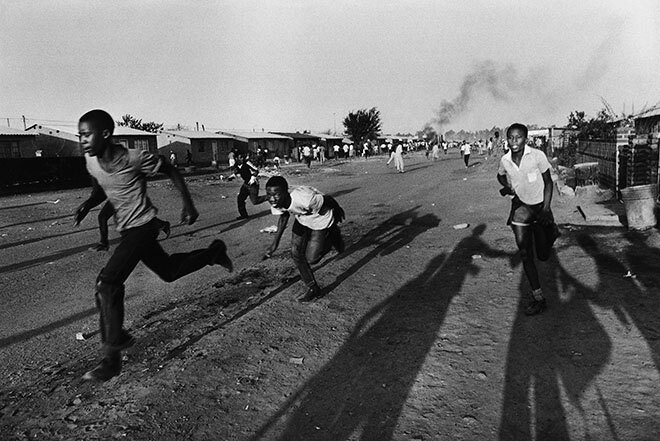 Men flee police bullets during a conflict that erupted after the funeral of a young boy, shot by police the previous week. 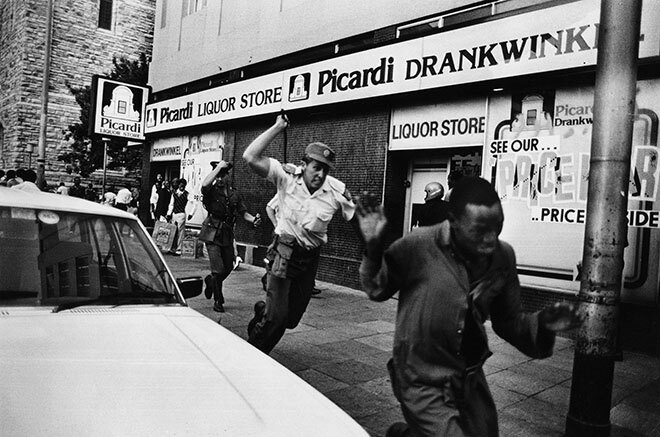 Police attack demonstrators in central Johannesburg on the day that ANC fighter Benjamin Moloise was hanged. Trade unionist Moses Mayekiso is violently arrested while leading a protest march during wage negotiations in Johannesburg. Members of the Metal and Allied Workers Union had marched from the union offices to the City Hall and were confronted by police. Mayekiso was arrested on numerous occasions, enduring a long period of solitary confinement and the charge of high treason. After liberation he was briefly a member of parliament, but resigned two years later in frustration at the lack of grassroots engagement. A traffic policeman responds to a gunfight between Inkatha and ANC security forces, just prior to South Africa’s first free elections. 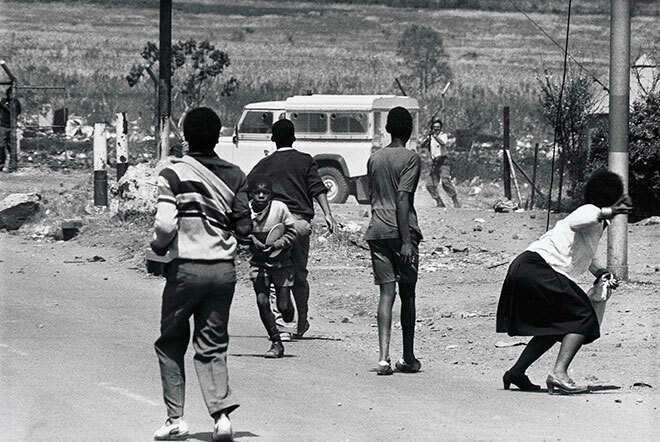 The fight began after an Inkatha march was fired upon, resulting in a series of gun battles that left 20 dead and many wounded. The son of Chief Ampie Mayisela leads his father’s funeral procession in Leandra. His father, who was active in a local campaign against forced removals, was killed by a group of right-wing vigilantes who had been encouraged by the police. 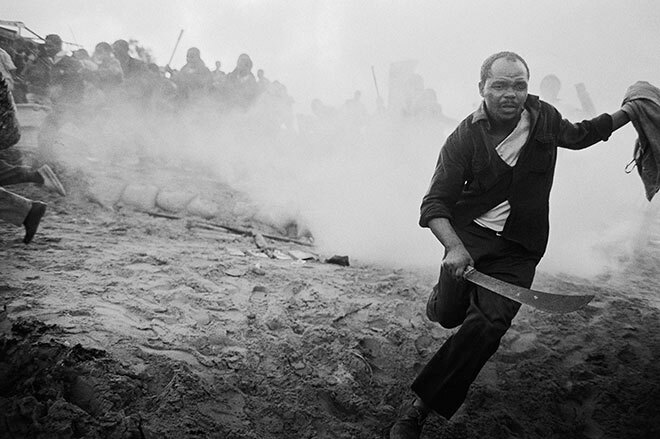 Shortly after the funeral, one of the vigilantes was attacked and killed in retaliation. Winnie Mandela defies her banning order by attending the funeral of one of her supporters, who had been murdered by vigilantes in Brandfort. 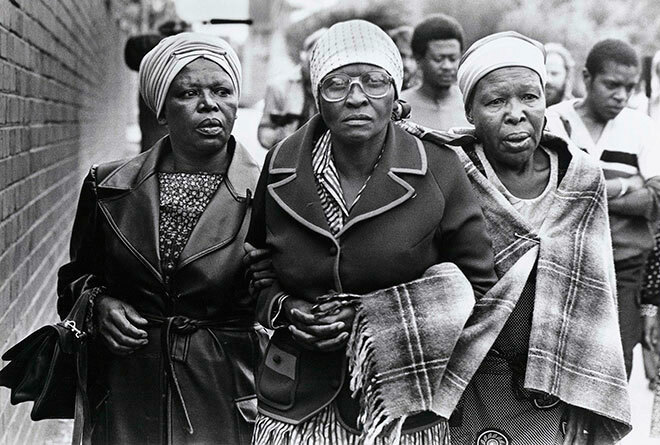 Mandela had been exiled from the city by the government, but chose to ignore the order and attend the funeral. 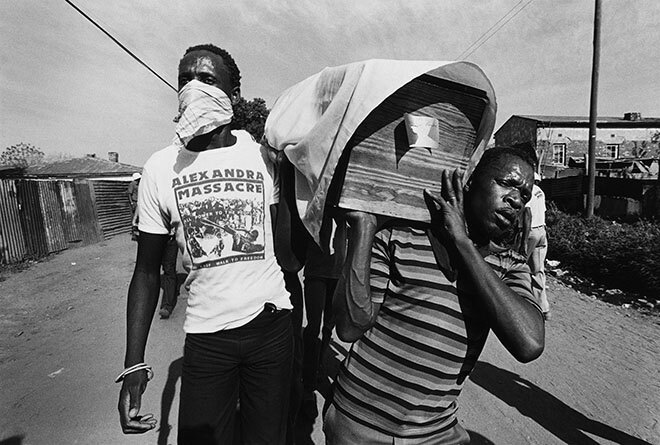 A coffin draped with the flag of the outlawed ANC is carried during the funeral procession for the 27 victims of the Alexandra massacre. Police had clashed with youths after the funeral of a schoolboy who was killed by a shopping complex security guard. 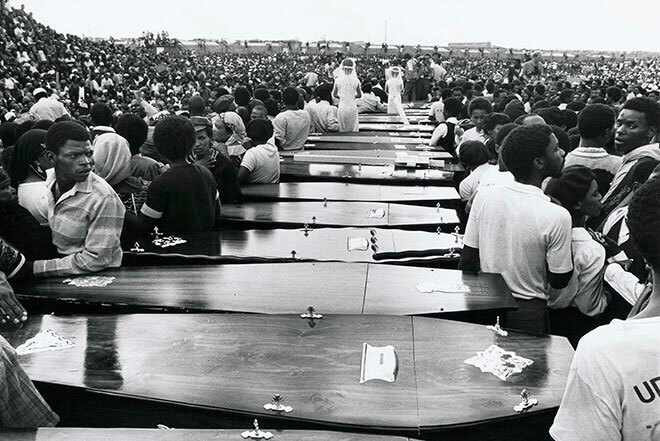 The mass funeral held at Kwanobuhle Stadium for 28 victims of the Uitenhage Massacre. Two young girls dressed as brides stand amidst the coffins. 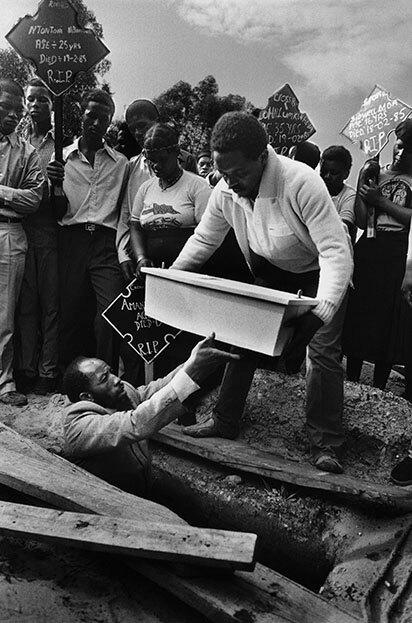 This symbolic ritual happened at numerous political funerals in the Eastern Cape. 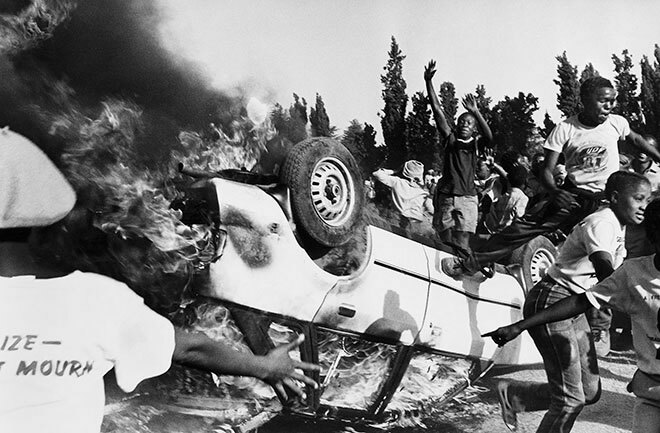 The massacre took place when police opened fire on a crowd of demonstrators, who were themselves trying to observe the 25th anniversary of the Sharpeville massacre of 1960. The tiny coffin of Amanda Fanisa is lowered into her grave during a mass funeral held in Crossroads Squatter Camp. Violence had flared between police and residents in response to threats of impending forced removals. Eighteen people died in the clashes, including six-month-old Amanda who was asphyxiated by tear gas fumes. Wooden guns are symbolically displayed at a funeral for victims of the Queenstown Massacre. Eleven people had been killed when police attacked a community meeting that was being held in a church, lobbing teargas and firing through the windows. 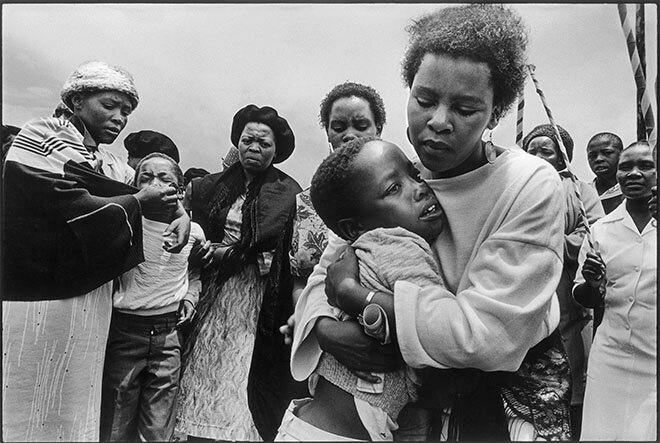 The children of a male nurse, shot by police, are comforted at his funeral. He was allegedly shot while waiting at a police roadblock. Funerals had become a form of political protest in themselves by this time, however the sense of deep tragedy that accompanied them was never lost. 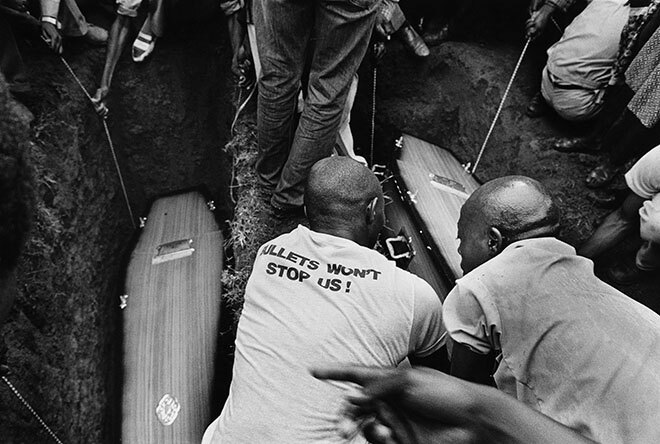 ‘Bullets won’t stop us!’ A slogan on a T-shirt as the victims of the Queenstown Massacre are buried.